Triumphant Victorious Reminders: October 9, 2009, "Amazing Race, Family Night"
She is so kind and thoughtful as her school had an 'Amazing Race' Theme PTO Family Night, along with a fabulous Book Fair. She allowed me to utilize her as my 'prop' for our country that we represented. I did allow her to take a quick break to get her passport stamped from all the different countries. The 'theme' allowed visitors to 'travel' to the 7 Continents in an hour ~ so cute and everyone did a fabulous job. 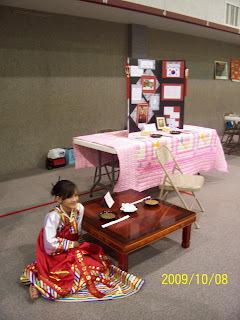 We represented South Korea. 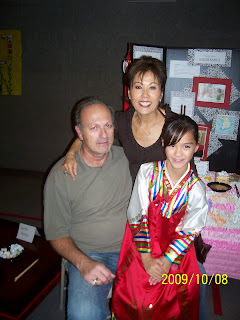 Of course, my mom is Korean and my dad is American (Half Lebanese and Half German). 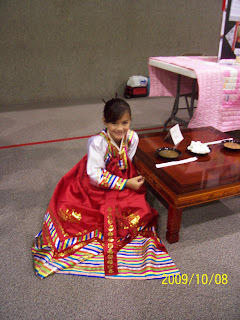 I love the Korean culture and just the country itself, I desire to visit there one day soon. Grandpa and Grandma came for a surprise visit; Tristin and I were very blessed that they came. 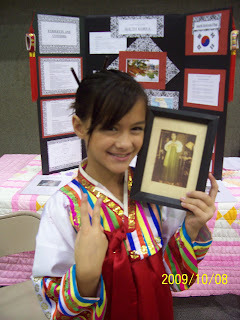 Below is a picture of Tristin and a photo of Grandma when she was 18 years old in her hanbok. Oh my! She is just beautiful!!! BTW, I have an award for you over at my place!!! What a pretty girl...beautiful just like her mom AND her grandma!! 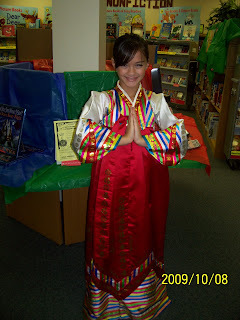 I love the traditional Korean wardrobe. The colors are STUNNING! It's neat how you let her know how blessed you are to be her mom...I know she will hold tight to those words forever!